Located in the birthplace of L.A., El Pueblo de Los Angeles Historical Monument, the Mexican Cultural Institute is a hidden gem where local and internationally-known painters, sculptors and photographers showcase their work to crowds of tourists and locals who visit Olvera Street. It's also is a venue for musicians, dancers, authors, poets, historians and others who have something to share and knowledge to drop about la cultura Mexicana. It's where I spend a lot of time. I'm the executive director, a volunteer position. 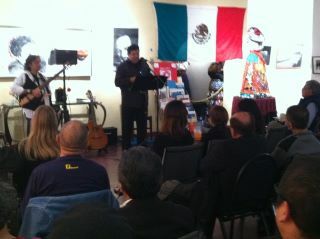 Here is a photo from tonight's Dia de la Bandera / Dia del Chilango event, which included music, the opening of "El D.F. in L.A." exhibit and lots of platica about the upcoming elections in Mexico and the struggle of immigrant Mexicans for their right to vote. The exhibit continues until April 1. Gallery hours are noon to 6 pm, Thursday through Sunday. Drop a $1 in the box, por favor.